Virtual reality (VR) is getting really popular and of course children and teens want to get in on the action. However, popular VR headsets have age restrictions that mean that they are not recommended for use by pre-teens. We thought it would be useful to go through the current age recommendations for the market-leading and kid-targetted VR headsets. Note that guidance from companies has changed in the past and is likely to change again. Do check the current recommendations before purchasing. It's a combination of factors. Children's eyes and brains are still developing and so far there's insufficient research to show that extensive use of VR is safe for children. That's not to suggest that VR is known to cause problems, just that the industry is understandably cautious at this point. Adults and teens are big enough business, they don't need to target children and putting an age limit on their devices means that they don't have to get answers to the hard questions. We'd love to see more independent research to help us understand potential issues. Additionally there are potential side-effects such as dizziness, nausea and walking into things ... The leading high-end VR headsets are designed for immersive play and children may find it hard to know when to stop. Again, more research is needed. There's some concern about psychological issues resulting from use of VR but again, I haven't seen any conclusive evidence and I would expect that there would need to be other risk factors. You could make the counter argument that if VR is becoming pervasive then kids should get access to it and learn how to use it safely while they are young enough for parents to have control over the situation. 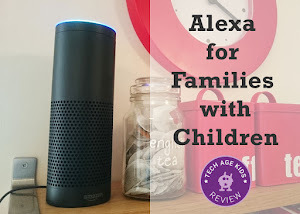 There are some options for pre-teens though - these are smaller, lighter devices that are intended to be used in short sessions with parental supervision. Some VR headsets require a compatible smart phone. You place the phone in the headset and a different image is shown to each eye to create a VR effect. You're limited to the graphics power of the phone so don't expect high resolution. Other VR headsets work with a high-spec PC. You'll get a much superior immersive experience but you'll pay for it! And others are tied to a specific games console such as the Playstation VR. 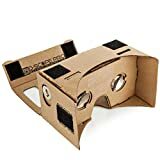 Google Cardboard is a low cost VR platform that allows you to view Cardboard VR apps using a cardboard-compatible headset. Some of the headsets are actually mostly made from cardboard which keeps the cost down but it's also possible to have compatible headsets made from other materials like the View-master VR headset. Basic Google cardboard headsets aren't specifically designed for children but are at least light weight. Check for additional age restrictions for specific headsets. Google has Google expeditions VR content which is designed to be used by children in schools. The View-master VR Headset (and new Deluxe version) is designed specifically for children from age 7+, with parental supervision. It's based on Google cardboard and works with selected iPhones and Android phones. 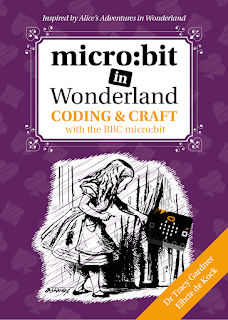 We think this is a great starter option for younger children and tweens. The View-master Into the Labyrinth game is excellent and you can access lots of Google Cardboard content with the viewer, you're not just stuck with the View-master content. The headset itself doesn't look childish and is nicely packaged. It's a great option for big kids and tweens who are too young for an adult VR headset but want a taste of the latest technology. The headset is designed for physically smaller users and doesn't have a strap which discourages overly long playing sessions. If even younger kids want to get in on the VR action then you can still get a classic View-master 3D reel viewer which is recommended for children from age 3 and up. 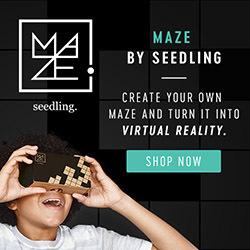 Maze by Seedling is a physical maze that you build and then use with a cardboard VR viewer that kids can decorate themselves. The Seedling DIY Virtual Reality Viewer is recommended for children from age 8+. The Maze app is only available for iOS at the moment. If you're an iOS household that likes to encourage creativity combined with modern tech then take a look at Seedling's offering. The Merge VR is a lightweight headset designed for age 10+, it works with compatible iOS and Android phones. The headset is made from foam and designed to be comfortable to wear and to protect the phone that you place inside it. 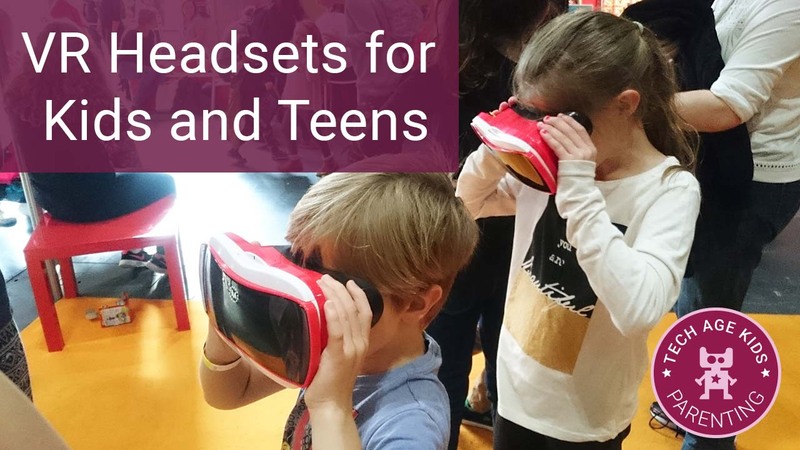 The headset has lenses that can adjust to suit different distances between eyes - this is really important for VR to work well and obviously kids have smaller distances between their eyes. The company announced their companion Holo Cube (now renamed Merge Cube) at CES 2017 which is a physical box that works with the Merge VR headset to create augmented reality holograms that you can hold and interact with. Update: We've reviewed the Merge VR Googles and they're a great solution for older kids. We like the direction the company is taking too. 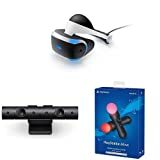 The Playstation VR headset is a new product for 2016 and is likely to appeal to young people who enjoy console games and already have a Playstation 4. It has a slightly lower starting age than other options. The product description states "This VR headset is not for use by children under age 12." The lower age limit may mean that families are more likely to adopt this solution as their kids will reach its lower age limit first. Note that you'll need a PlayStation 4 camera as well as the console itself and some titles make use of the Move controllers too. 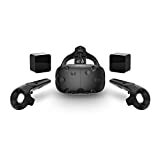 Vive is a VR headset and accessories that is designed to be used with high performance PCs. It's developed by HTC and Valve, the developers of the popular Steam games platform. The HTC Vive doesn't provide a specific age restriction, just recommendations for what to do if 'older children' are permitted to use the device. The product was not designed to be used by children. Do not leave the product within the reach of young children or allow them to use or play with it. They could hurt themselves or others, or could accidentally damage the product. The product may contain small parts with sharp edges that may cause an injury or which could become detached and create a choking hazard for young children. Consult your doctor immediately if any parts of the product or accessories are swallowed. If older children are permitted to use the product, then adults should monitor them closely for any negative effects during and after their use of the product. Google have recently announced their Daydream VR headset which is designed to be lightweight and comfortable and has an accompanying controller. Like Cardboard, it's designed to be used with a phone. This time Google have added an age restriction to the product specification: "Daydream View should not be used by children under the age of 13." The Samsung Gear VR is another popular phone-based VR headset. It's usage manual is quite clear that it is only for age 13+ and even then younger users should be supervised. An upper age limit isn't specified for children who need to be supervised. The Gear VR is powered by Oculus (who make the Oculus Rift headset) and their advice is similar. It is made clear that adults should supervise young people during use of the Gear VR and afterwards. 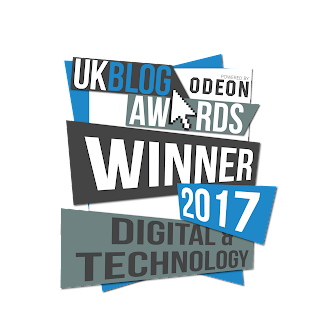 Oculus are one of the key innovators in the VR space and their Oculus Rift headset is their full-featured offering for use with a high spec PC. I've tried an Oculus Rift and it's a fantastic experience. My son has also tried it. He's under the current age recommendation, but this has changed in the past and he met the age limit for the demo we attended. 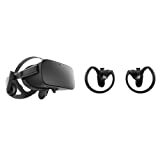 There's a new Touch Controller for the Oculus Rift coming out in December and it's available to pre-order as part of a bundle with a headset. We definitely recommend supervision at all time - kids will forget where they are and walk into things and may get dizzy. Teach them to recognise any adverse symptoms and take a break from playing, though you'll also need to watch and enforce this. For the 10+ age range the Merge VR is looking interesting as they are bringing out the companion Holo Cube and developing content for a younger audience. Once children reach 12 you've got PlayStation VR as an option and at 13 the full range of adult options opens up. Teens will still need supervision though. VR games and experiences can be very immersive and not all teens are prone to good decision making! Honestly, I would want someone else around when using a VR headset so that I don't accidentally walk into something or knock something breakable off a shelf. We expect the guidelines to change as the technology improves and there's more research to understand the effect of VR technology on children. We don't think VR is going away though, this definitely feels like the start of something big. 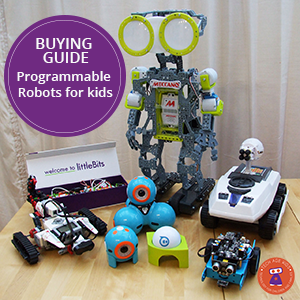 Of course kids will want to be involved and there are age-appropriate ways to do this.